There’s a pretty confusing system when it comes memorising HSC Visual Arts core content, because there doesn’t seem to be one set curriculum or topic for everyone. So when it comes to studying for exams, what are you meant to focus on? Well, that’s what we’re here to tell you. You should be focusing on the Big 3 of HSC Visual Arts core content. The Big 3 of HSC Visual Arts are the three most important theoretical elements of the subject, making them your ticket to awesome marks. Memorise the HSC Visual Arts core content and you’ll be ready to smash any exam! Before anything else let’s look at what the Big 3 of HSC Visual Arts core content actually are. You should’ve learned about all three of these in class, but essentially they’re the tools you use to analyse artworks and pivotal to your HSC Visual Arts core content. Think of them almost like you think of techniques and context for English – they’re the evidence you use to prove your ideas. The elements and principles of design are things like colour, hue, gradient, balance, unity, etc. They’re individual pieces of what an artwork can be made up of, and each one affects a work in a different way, making them super simple to analyse. You can grab the full list of them here! The frames are something you’ve been using since year 7, so you should know them very well by now! Each of the frames works to analyse one specific aspect of an artwork, be it structural, subjective, cultural or postmodern. Asking yourself questions about an artwork based on the frames helps develop your ideas and analysis of the work. The conceptual framework is usually seen as the trickiest of the HSC Visual Arts core content, mainly because it focuses on how an artwork relates to the world around it. As you can see, each of these ‘Big 3’ is a tool you can use to analyse an artwork, making them essential for any HSC Visual Arts exam. But how do you use them? And what’s the best way to memorise them? So what are all of the elements and principles of design? For a full rundown of what each of these are and how they work check out this website! The point of each of these is to identify specific pieces of an artwork and what they do, or how they fit into the overall piece. You want to be able to pick out the most noteworthy elements and principles and comment on how they effect the work overall, whether it be by creative a specific mood or get across a specific idea. If you look at an artwork that uses bright orange and blue, you can immediately comment on the choice of colour and value in the work. The colours are complementary, and a bright hue/value has been used. That in turn leads to you talking about how the use of complementary colours creates contrast in the image, which you may then use as evidence to prove a point about the subject of the work. While you’ll use the elements and principles of design for almost all your answers in any HSC Visual Arts exam, they’re especially important for the first section. When dealing with unseen images you need to be able to break them down quickly, so annotating different elements and principles of design in the works is always the best way to go! When using the elements and principles of design you’re trying to identify the little things that make up the whole artwork, just like how you would use literary techniques in English. For that reason the best way to learn and memorise them is by using them! Practicing annotating artworks using the elements and principles of design not only teaches you how to identify them, it also helps prepare you for annotating unseen images. You don’t necessarily have to practice on unseen artworks, but it can definitely help. Start by grabbing any artwork, in this case I’ll be using Alphonse Mucha’s ‘Advertisement for Job Cigarettes’. All you have to do is look over the artwork and start picking out which elements and principles of design are most obvious in it. Now what you want to do is briefly break down why each one is important and/or what impact it has on the artwork. Some will link (colour and contrast are very common links! ), while some will have more of an impact than others. It’s just about figuring out how each one is working in the image. You can also work on memorising the elements and principles of design by using flash cards. Simply create a flash card for each element and principle with the name on one side and the description on the other. Then lay them all name side up and see if you can define each one! Or get a friend to help out by quizzing you using the flashcards to see just how many you can remember without help. By the senior years you should know exactly what the frames are, seeing as though they’re essential to the HSC Visual Arts core content, so I’ll skip over the long boring explanation and let this neat table do the talking for me. How has the artwork been made? What is the mood of the work? How is the mood created? What do you think the artist felt? When and where was the work made? How has this influenced it? Is it a new take on something? Does the work appropriate another artist? Does it appropriate another artwork? Why does it appropriate them/it? How has it changed the original meaning? Basically the frames are just four different categories of questions to ask yourself about an artwork when analysing it. Obviously you don’t have to answer every question from every frame for every artwork, rather you’re looking to comment on the ones that are most important for that specific artwork. Generally speaking the structural and subjective frames work on all artworks, because they’re about what it is and how it makes audiences feel, however the cultural and postmodern frames can be trickier. This means you have to consider each frame first to see if it suits the work, then decide what questions to ask yourself and how you’re going to write about the ideas you come up with. Note: The aim of asking these questions is to come up with different ideas to write about or analyse. These are your key points in your paragraphs, so you want them to be pretty strong and relevant, and the best way to learn is by doing. You know what that means – time to practice using the frames to nail that HSC Visual Arts core content. Using the same image from before, I first have to ask myself which of the frames are most relevant to it. From here I can see that the subjective frame is most important, so I can start asking my questions based on that frame to find some key ideas about the work. Remember that you may need to build on your answers before you find the really strong ideas. The work is relaxed and has a mood of effortlessness, the figure seems calm and almost aloof with a sense of ‘cool’ to her. The use of organic shapes in the figure and complimentary colours creates visual cohesion that makes the image relaxing to look at, while the muted colours and purple background create a sense of calm. 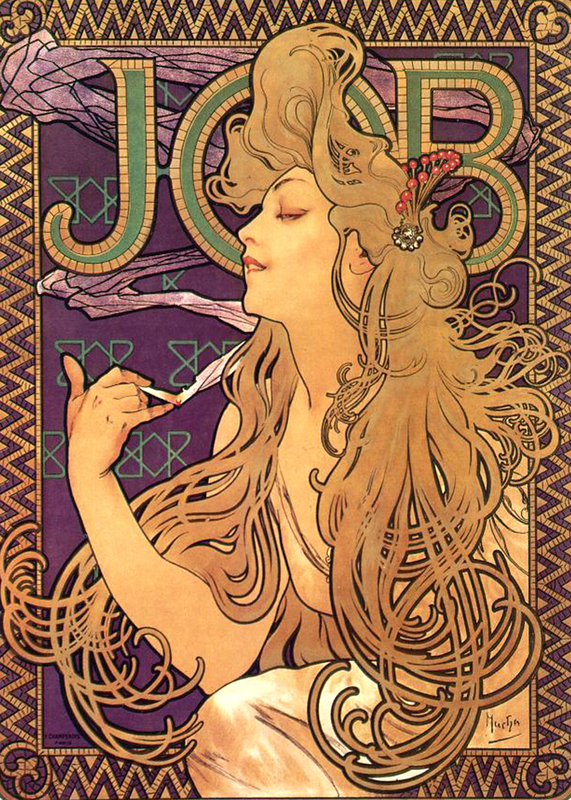 Mucha created this as an advertisement for Job Cigarettes, so he probably wanted to create a sense of them being ‘cool’ and desirable. The audience feels relaxed and then associates that feeling with the cigarettes, encouraging them to buy the product being advertised. From these few questions we already see a pattern forming – the image is relaxed and ‘cool’ because that was the best way to portray the product being sold. This idea can then be taken into any response and used as the basis for a really strong analysis paragraph! Also note that even in our simple answers we’ve started to comment on elements and principles of design mentioned before; colour, complimentary colours, shape, etc. By practising asking and answering these questions you’ll be able to effortlessly analyse artworks using the frames in no time. Make sure to vary the artworks you’re practising on and try to find answers for all of the frames rather than just focusing on one in order to get a well-rounded knowledge. Protip: If you’re having trouble memorising the frames and questions themselves the best course of action is quizzing! Simply print out a copy of the frames and questions above (you can find it here!) and give it to a friend – then have them quiz you on what each frame is and what questions should be asked when using that frame to analyse. If you’re feeling extra confident grab an artwork as well and have them ask you questions about the artwork – you have to answer the question, as well as telling them which frame it relates to! Okay, so here’s where a lot of people get lost. You’ve got your evidence in the elements and principles, your ideas in the frames, so what does the conceptual framework offer? Context! It’s just a bit confusing in how it goes about it. The conceptual framework is essentially breaking down how an artwork interacts with the artist, the audience and the world. How does the artist relate to the artwork? What does the artwork show about the artist? How does the audience react to the artwork? What does the artwork show about the audience? How has the world influenced the artwork? What does the artwork show about the world? While these questions seem very open-ended, they’re like that because the conceptual framework is a super broad, abstract way of looking at things. The main goal is to answer at least one or two of the questions, not all six, because you’re trying to find the answer that best suits what you’re saying. This means that if you focus on the cultural frame and analyse how an artwork shows cultural relevance, you may want to focus on questions 5 and 6, as culture is part of the world. In order to memorise the framework the best thing to do is draw out the mind map above a few times and keep them in relevant places. Protip: Create a large poster to hang above your desk, or draw it on post it notes and stick them through your art study. The point is really get that visual stuck in your head! You can also memorise the questions if you want to – flash cards and quizzing are the two best ways to do it. Of course, as usual we also recommend that you actually practice working with the conceptual framework in order to really get it to stick! Let’s use the Mucha example again! From the frames section we know that we’re focusing on the idea that the image was created to persuade audiences to buy a product, so we should focus on questions 3 and 4. Audiences feel calm and relaxed when viewing the work, making them more inclined to view the product in a positive way. This was the reaction Mucha most likely desired and therefore the audience is reacting as the artist intended. The work shows that the audience were likely from a time when smoking was still considered fashionable and desirable, as well as being easily swayed by visual marketing and advertising. From these two answers we can see small connections to the artist and world as well, showing how all of the elements of the conceptual framework eventually connect. For now however, we have enough information to effectively use as context for our ideas and really round out our analysis of the image (at least for one paragraph!). Reading through the article you probably noticed a pattern – each of the Big 3 HSC Visual Arts core content had practice listed as the best way to memorise the HSC Visual Arts core content. And you know what? It’s the truth. The phrase practice makes perfect really is accurate, as even though you can memorise these concepts in theory, actually using them is what’s going to build your skills. You can memorise every element of design, but if you don’t know how to use them then they’re not good for anything! Using flashcards, quizzing and other memory boosting methods are awesome for keeping your knowledge of Visual Arts core content sharp, but practice really is the best way to go! Looking for extra help with HSC Visual Arts? We pride ourselves on our inspirational HSC Visual Arts coaches and mentors!